The History of the "Friends of St Katharine Docks"
St Katharine Docks was the first London dockland regeneration project and became an award winning showpiece development from the mid-1970s for Taylor Woodrow who were the landowners at that time. The Docks had been extensively bombed during the war and subsequently left derelict. The Ivory House, built in the 1850s and the only warehouse to survive the blitz, was converted into flats. New build residential properties followed; flats on Marble Quay and "cottages" along Mews Street, luxury apartments at City Quay and town houses at Tower Walk. In addition there was a good deal of commercial development; the Tower Hotel was one of the first new buildings on the site and office space was provided by the construction of International House which was to become The World Trade Centre in London, Europe House (since demolished), Commodity Quay and Devon House. The Dickens Inn pub was created from the structure of a former warehouse that was moved to Marble Quay. The regeneration of the area naturally drew in tourists who were attracted by the tranquil setting of this unique part of London, close to Tower Bridge and the Tower of London. Initially, as often happens in urban environments, there was little sense of community and few of the residents knew each other. There was no resistance therefore when Europe House, a very unattractive office block, was demolished. However its replacement, with a very bulky modernistic glass structure (now Tower Bridge House) that additionally swept away a very attractive Japanese Water Garden raised a few eyebrows. Planning permission seemed to have been nodded through, possibly on the strength of the fact that it was a Richard Rogers design. Eventually in 2005 Taylor Woodrow sold the entire site to Reit Asset Management (REIT), and clearly profit now became the overwhelming operational motive. REIT drew up redevelopment plans that would have put another huge modern office building on the site of Commodity Quay and, to many people's horror, a 16 storey glass residential tower on the site of the Coronarium in the centre of the Docks. Something had to be done. Two neighbours in Mews Street (who having similar addresses had got to know each other thanks to their post being regularly misdirected!) met to discuss the matter. How to defend their beloved Docks from being ruined by the new owners? Knowing that they had an eminent neighbour, an ex-Cabinet Minister, they composed a letter asking for support, and delivered it by hand. 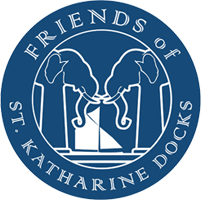 A return phone call confirmed that they had the support they sought, and effectively, the "Friends of St Katharine Docks" (FOSKD) was born. Word soon spread and a small Steering Group was established. Representations were made to Tower Hamlets Council, letters of objection co-ordinated, and the initial success was to see the tower block removed from REIT's redevelopment plan. One big project however remained; the proposed demolition of Commodity Quay and its replacement by a huge modern office block. This, everyone felt, would ruin the sense of place and was totally unsuited to the location. REIT refused to discuss any matters with the Steering Group and even resorted on more than one occasion to posting details of Planning Applications over Christmas holiday periods when people's minds were focussed elsewhere! The Council officers recommended the revised proposals by REIT, but after another strong campaign mounted by FOSKD the Council overruled their officers and the plan was again rejected. However, REIT appealed to the Secretary of State, which meant a Planning Inquiry, and they employed one of London's top planning QCs to represent them. In response, the FOSKD Steering Committee raised over £168,000 to support the Council and fight their case, employing one of the country's leading planning lawyers and their own top planning QC! FOSKD won the day and REIT's plan was rejected by the Council in its entirety in May 2010. At this point a Council official commented that "The Friends of St Katharine Docks are a force to be reckoned with"! So having achieved the objective of successfully opposing the proposed redevelopment, the question was - what next for FOSKD? As previously mentioned when FOSKD began there was little sense of community within the Docks, but by the end of the redevelopment saga this had completely changed and those who had been involved with the campaign wanted this spirit to continue. So it was decided that FOSKD should be formalised, and in Spring 2011 a constitution was drawn up. An Executive Committee was formed and membership by subscription was promoted with a varied programme of social events and a concessions scheme providing discounts for members with local retailers and restaurants. The website was developed allowing information to be disseminated rapidly amongst members. Their redevelopment plans having been thwarted, REIT decided to sell the entire site which was eventually bought in August 2011 by Max Property Group plc (MPG), a closed end investment fund managed by Prestbury Investment Holdings Ltd and the residents of the Docks wondered once more what the future would hold. MPG's top management quickly made contact with the FOSKD Executive Committee with the aim of "consultation rather than confrontation" for the future. MPG accepted FOSKD as being a vital element in their renovation plans and initiated a series of regular meetings and consultations between the two groups. Under MPG's ownership St Katharine Docks have been substantially improved with FOSKD being consulted over all Planning Applications prior to submission to the Council. Commodity Quay has undergone an internal re-development scheme rather than being demolished and the Marina facilities have been greatly improved. New lighting and signage schemes have been introduced and new restaurants & office tenants have been attracted to the site. In August 2014 MPG received an offer for its entire share capital from Blackstone, a global investment and advisory firm, which was accepted by their shareholders some eighteen months ahead of when MPG was originally due to have been liquidated. So once again in its long history, the ownership of St Katharine Docks changed hands. Since their arrival, Blackstone have carried out a major refurbishment of the Marina facilities; up-graded the office accommodation in International House; changed the signage scheme throughout the estate and made some changes to the public realm. Currently a refurbishment of Devon House is underway in order to provide better quality office accommodation on the river frontage. Membership of FOSKD has grown substantially since 2011 and our members care passionately about the future of the Docks. The FOSKD Executive Committee have established a strong reputation for their constructive and consultative approach in dealing with matters affecting the future of the Docks, and they continue to work with the owners to try to ensure that this special part of London will continue to be enjoyed by residents, commercial tenants and visitors alike.